In 2017 the chapter sponsored 6 schools, as well as the Pleasant Hill Lake welcome center in participating in the Trout in the Classroom (TIC) program. The Pleasant Hill Lake welcome center and Mount Vernon High School both received brown trout eggs. GlenOak High School, Dalton Middle School, Orrville High School, Malvern High School, and Hiland Middle School all received rainbow trout eggs. 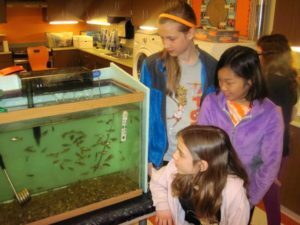 The Ohio Division of Wildlife (DOW) provided fertile trout eggs to the schools. This was the first year the Pleasant Hill Lake welcome center participated in the program and they went all out. The assistant park manager, Chuck Statler, not only was responsible for raising the trout, but he set up a live webcam for people to view the trout. At the time of the release they had 6 trout ready to release with the smallest being 3.5” and the largest being 4.75”. We really appreciated the effort and enthusiasm Chuck brought to the program. Unfortunately, he is no longer working with the park and we were informed that they will not be able to participate in 2018. This was the second year participating for Malvern High School and they ended up having much better success than the first year. Unfortunately, the first year they participated everything was going well and then one day when teacher, Mrs. Natalie Kee, came into the classroom she noticed all of the fish had died. This year that was not the case. They had 40 trout survive to release into Apple Creek on May 15th. That is a 40% survival rate, which is very good. Mrs. Kee has shown considerable interest in the TIC program and is excited to participate again in 2018. This was the third year GlenOak has participated in the program and they have done a great job. Student Gavin Nupp has really shown a lot of interest in the program and regularly attends the chapter meetings. At one of our meetings he shared a video they put together and it does a fantastic job of showing the trout throughout the growth process. It also makes it clear that the GlenOak students really enjoy the program and it’s not just one or two kids doing all the work. GlenOak’s STEM Physical Science Teacher has done a great job with the program and this year they had around 40 rainbow trout that were released in Apple Creek on May 16th. GlenOak will also be participating again in 2018. This was Dalton Middle School’s third year participating in the program. Teacher, Mrs. Laura Grimm, also does a great job of keeping her students engaged in the program. She finds ways to incorporate the TIC program into her normal lesson plans, which offers the students a more interactive and enjoyable way to learn. She also has mastered the art of raising trout. This year out of approximately 100 rainbow trout eggs that they received her and her students were able to successfully raise around 85 trout! These fish were released in Apple Creek on May 2nd. It will be interesting to see if they can top that number, as Dalton Middle School will be participating again in 2018. Orrville High School have become veteran participants of the program, as last year marked their sixth year of participation in TIC. They also had a very successful year successfully raising 62 trout. Most of the trout ranged between 6-10 cm. Orrville High School Physical and Geo-Sciences teacher, Mr. Jim Duxbury, informed us that they successfully released all of the fish in Apple Creek on April 24th. They had 12 students attend the release, which is a great turnout and shows the strong interest that students have in the program. In addition to the students, there also was news coverage from “The Daily Record”. Jim informed me that not only will they be participating in the program again in 2018, but the students loved it so much that in the interim between school years they are using the tank to raise around 50 small fish rescued from some local puddles created after a heavy rain event. This was the second year in participation for Hiland Middle School. Teacher, Aaron Rossetti, informed me that the results were a little better this year than last. He mentioned that towards the end of the year he did partial water changes in the tank daily and he believes it really helped with trout survival. They successfully raised 12 trout, which were released into Apple Creek on June 17th. At the end of the program Mr. Rossetti mentioned that he missed the trout from the time he released them and they definitely will be participating again in 2018. For Mount Vernon High School this was the fourth year participating in the program. Unfortunately, this year did not go as well as in years past. Teacher, Mrs. Bonnie Schutte, mentioned that in December she believes the city of Mount Vernon may have changed the source of their water. Right after this happened all of the fish they had raised up to that point were lost. Mrs. Schutte said that they will be taking a year off and will not be participating in 2018, but hopefully they can start back up again the following year. All in all it was another very successful year for the TIC program. The chapter plans to sponsor the five schools mentioned in the article next year in addition to possibly adding a new school for 2018. The initial setup for a TIC project costs ca. $1,000 including the tank, pumps, filters and the most expensive, the chiller needed keep the water at 55F. We provide these schools with opportunities to apply for grants to support the program. We look forward to another great TIC program for the 2017-18 school year. Submitted by Anthony Salupo, CFRTU coordinator for the Trout in the Classroom program, November, 2017.